With the recent release by the Bureau of Labor Statistics of the January job numbers, we can now look at the job record of Obama over his full first term, and compare it to that in the first term of Bush or others. These new BLS numbers also reflect the impact of the re-benchmarking revisions (done each year at this time), which we noted in a post on this blog in October would likely show a substantial upward revision in the private job estimates in 2012, along with a substantial downward revision in the government job estimates. The graphs above reflect these new numbers, and show cumulative job growth, private and government, over the full first terms of Obama and Bush. Mitt Romney and his fellow Republicans repeatedly charged in the recent campaign that private job creation plummeted under Obama, while he boosted government spending and jobs for bureaucrats. The exact opposite happened. Private jobs were indeed plummeting when Obama took the oath of office in January 2009, as he inherited the economic crisis that had begun in the last year of Bush. But through the stimulus package and other measures (including in particular aggressive action by the Fed), he was able to turn this around quickly. The economy started to grow again six months after he took office, and private jobs began to grow a year after he took office (see the top graph above). Private job growth has continued at a fairly steady rate since, and by the time Obama took the oath of office for his second term, there were over 1.9 million more workers employed in private sector jobs than when he took the oath of office for his first term. More significantly, there were 6.1 million more private sector jobs when Obama ended his first term term than there were at the trough a year after he took office. And as the graph above shows, the pace of new private job creation has not slowed since that trough three years ago. 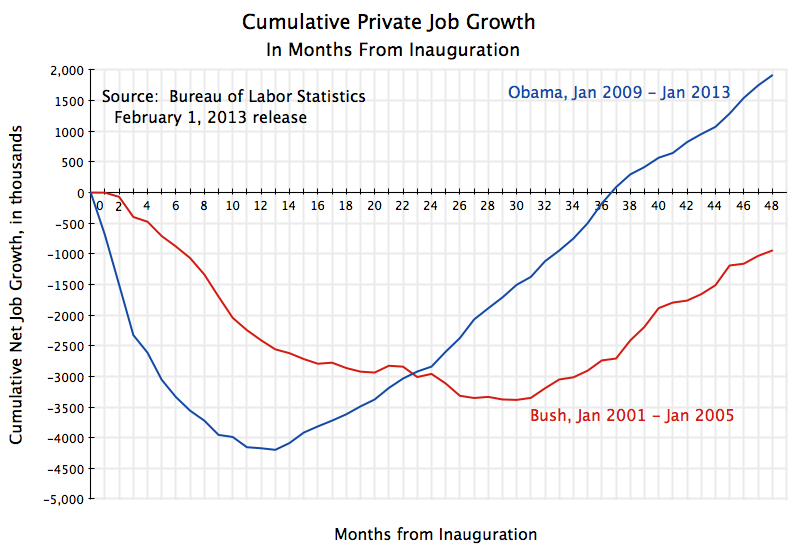 In contrast to the Obama record, private jobs fell during the first term of George W. Bush. There were 950,000 fewer workers employed in private jobs when Bush started his second term than when he started his first. They were also not plummeting when he first took office, as they had been under Obama, but only started to fall a few months later. They then continued to fall for the first two and a half years of his term before finally starting to rise. And when they finally started to rise, they grew at a slower pace (102,000 per month) for the last year and a half of Bush’s first term, than they did (at a pace of 170,000 per month) over the final three years of Obama’s first term. Yet Republicans continue to argue that the policies under Bush, of tax cuts and lax or no proper regulation, are necessary to support the “job creators” and lead them to create private sector jobs. The record shows that the approach followed under Obama was far more successful. With a current labor force in the US of 156 million, the simple direct impact, had one allowed government jobs to have grown during Obama’s term as they had during Bush’s first term (the net difference of 1.62 million jobs), would have been to reduce the unemployment rate by 1.0%. That is, the direct impact would have been to reduce the unemployment rate to 6.9% from the current 7.9%. But there would also have been indirect impacts, as the newly employed government workers would have purchased goods and services with their new income, which would have in turn employed workers to produce those goods and services. With a conservative estimate of this multiplier at two, unemployment would now be at 5.9%, which is within the range of 5 to 6% unemployment which is generally considered to be full employment (unemployment will never be zero). There would of course also be a budgetary cost to employing more government workers. But it is not that much. Using BLS data on the average total compensation costs (including benefits) for government workers, employing an additional 1.62 million public sector workers would cost $140 billion per year. While significant, this is only 2.5% of the $5.7 trillion that government spends each year (at all government levels) in the US currently. Furthermore, the net impact on the budget will be a good deal less as there will be increased tax revenues generated as more people are employed (both directly and indirectly). The still high unemployment in the US can therefore be accounted for by the decline in government employment during Obama’s first term. Had government jobs been allowed to grow as they had under Bush, we would now be at, or at least close to, full employment. Furthermore, while the calculations here use the growth of government employment during Bush’s first term as the benchmark, that growth of 900,000 government workers under Bush was not out of the ordinary. Government employment grew by a bit less during Clinton’s first term (by 690,000), but by more during the term of Bush’s father (by 1,240,000). Government employment also grew by 850,000 during Bush’s second term. One would expect government to grow in an economy that is growing with a population that is growing. 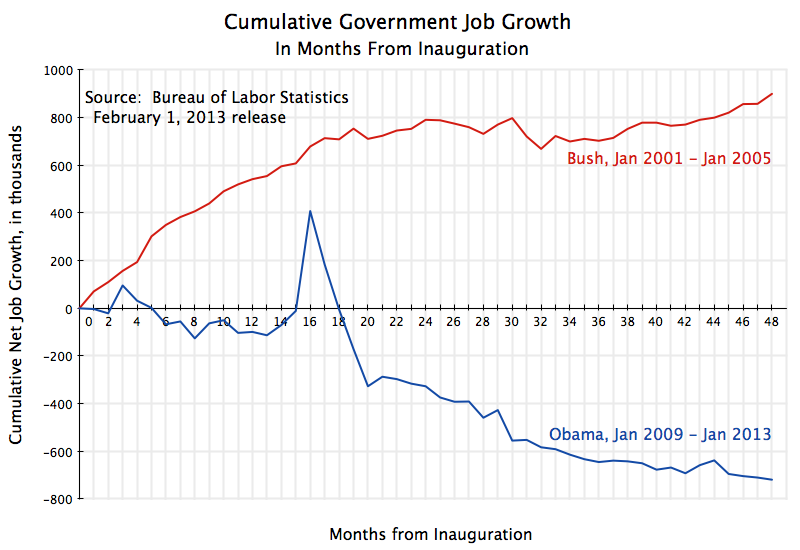 The growth in government employment during Bush’s first (and second) terms was not unusual nor was it inappropriate. Rather, what was unprecedented was the sharp fall during Obama’s first term. Never before in US history (at least as far back as 1939, when the BLS statistics start) has government employment fallen by so much during a presidential term. The only instance that can rival it is the fall after World War II during the 1945-49 term, when government employment fell by half as much as it had under Obama (by 360,000 then, vs. by 720,000 under Obama). The sharp cut-back in government jobs under Obama is therefore historic. It can account for the still high rate of unemployment. It would not cost that much to hire back the school teachers, health care workers, policemen and firemen that have lost their jobs or have not been able to get such jobs. Yet despite such historic cuts, Obama is still seen by conservatives as a socialist presiding over a government exploding in size. This entry was posted in Labor and tagged employment growth, government employment, job creation, Obama, private employment, unemployment by aneconomicsense. Bookmark the permalink.